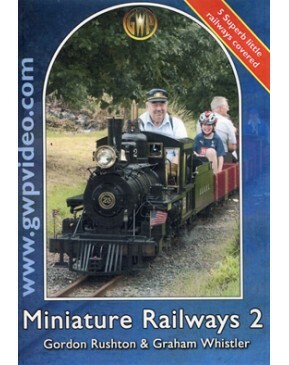 Ninety minutes of video, on the train, at the lineside, and in the locomotive sheds on five individual railways, some of which are private, some of which only open at restricted times. Echills Wood is a wonderful railway, with extensive trackage, and a section of line that allows parallel running - filmed with two of the biggest 7¼ inch gauge locomotives in Britain! There’s a lot more action at Echills Wood, that also hosts many other locomotives on its long tracks. Visit the remote and very private Wilderness Railway, locked away in a secret location. This 10¼ inch gauge railway has an interesting run and is not open to the public. See the huge No. 25 in action on the Norton Hill Light Railway, along with rare Yugloslav 2-6-2, and 0-8-2 NG prototypes, there is steam action on this fast and difficult line, as the trains blast up the very steep hill back to the terminus. See the mixed 7¼ and 10¼ gauge Eastleigh Lakeside Railway. 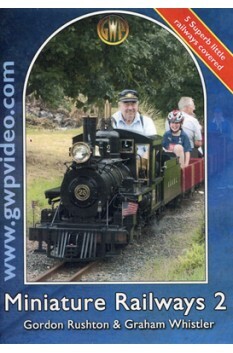 Visit and enjoy the train on the Exbury Gardens 12¼ gauge railway.